except for that star compass in my heart. tomorrow is my 3rd blogiversary. 3 years of standing on fields of flowers and shadows and pronouncing them poetry - perhaps it is perfect that this new year of blogging begins with my feet on concrete, hospital parking garage concrete, standing still in the not-knowing, standing still with the possibilities of anything. standing. still. but the rocket is flying forward, the stillness just an illusion, a magician's trick. in truth i am being pulled towards true north, heart first. my words have become whispers and prayers and feel stronger than i really am. choose soften as your word of the year, and the universe will bow to your command. i will testify to that. i will amen it. you will soften. How I love your grounded, star-seeking, softening-as-the Universe-bows words. Every one of them. i think that in many ways, fear and poetry always go hand in hand. i love this photo, all the possibilities, pointing forward. it feels like hope. happy blogiversary, your words are gifts, and though i have only been coming here for a year, it does feel like a lifetime. True North is a great direction to heading towards even if it has to be head first, so much yet to discover. i feel your softness and your strength, thinking of you. For me, fear and poetry are very connected. This week is my second blog anniversary, and I have been thinking a lot about fear. I once wrote a post called "Terror and the Art of Writing." I can't imagine writing--or creating anything--without some fear. I welcome it because it lets me know that what I'm doing matters. I'm a newer reader of your blog, but am glad I found your words. I hope you enjoy many more years of sharing here. I will carry the word soften around with me today like a worrystone in my pocket. I like the idea very much. It is time for me to stop resisting so much and bend. Softening will help that I think. I hope you are holding up as best you can in this difficult time. I am enjoying your photos and posts, though I haven't had much chance to comment. I'm still here reading, though, cheering you on. Congratulations on 3 years! I do believe life softens us, but at the same time become stronger and we know more and more who we are. you are standing just as strong as the concrete beneath your feet. I was baking cookies and thought to read the latest from you. Your words are nourishing; now time for some soft chocolate chip cookies. standing still, and still standing. strong like a triple braided rope, and soft like the strands of silk it is woven from. happy blogiversary, debi. i love you. sending you much love for all the beauty you have bestowed on my visits here with you. Has it really been three years already? What a journey you have taken during this time, in your life, through your blog, your words, your beautiful images...I am so grateful to have crossed paths with you along the way. i am contemplating the word soften also as i go about this year, waiting for the universe to bow. :) loved that line, debi. 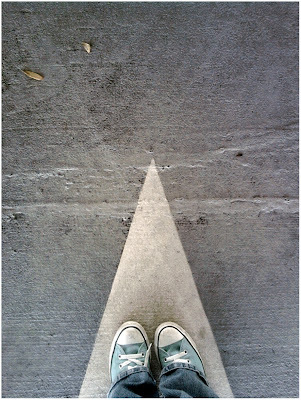 and love the image-love how the star point looks like a road you are traveling.